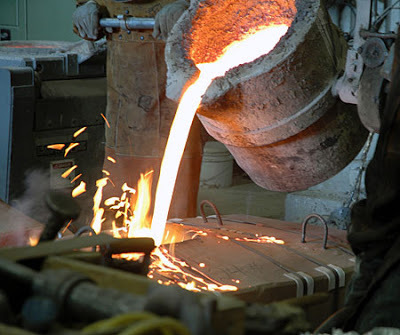 Casting is a manufacturing process where a solid is melted, heated to proper temperature (sometimes treated to modify its chemical composition), and is then poured into a cavity or mold, which contains it in the proper shape during solidification. Thus, in a single step, simple or complex shapes can be made from any metal that can be melted. The resulting product can have virtually any configuration the designer desires. In addition, the resistance to working stresses can be optimized, directional properties can be controlled, and a pleasing appearance can be produced. Cast parts range in size from a fraction of an inch and a fraction of an ounce (such as the individual teeth on a zipper), to over 30 feet and many tons (such as the huge propellers and stern frames of ocean liners). Casting has marked advantages in the production of complex shapes, parts having hollow sections or internal cavities, parts that contain irregular curved surfaces (except those made from thin sheet metal), very large parts and parts made from metals that are difficult to machine. Because of these obvious advantages, casting is one of the most important of the manufacturing processes. Today, it is nearly impossible to design anything that cannot be cast by one or more of the available casting processes. However, as in all manufacturing techniques, the best results and economy are achieved if the designer understands the various options and tailors the design to use the most appropriate process in the most efficient manner. The various processes differ primarily in the mold material (whether sand, metal, or other material) and the pouring method (gravity, vacuum, low pressure, or high pressure). All of the processes share the requirement that the materials solidify in a manner that would maximize the properties, while simultaneously preventing potential defects, such as shrinkage voids, gas porosity, and trapped inclusions.